Confession: I've been flexing my arms in the mirror lately. Read how strength training has helped me trim down and keep my bones strong. Confession: I've been flexing my arms in the mirror lately. I just got back into strength training, and after six weeks I'm starting to see defined biceps and triceps in my reflection. My strength training started in 2006, right after I came to Health, with a young Southern man named Josh who kept me going by saying things like "20 more, ma'am!" No matter how hard I tried, I couldn't get the "ma'am" out of him. I wonder if it was some kind of clever subliminal motivational device, as if the underlying message was, "Come on, my granny could have done 50 by now... ma'am!" When Josh moved on last October, I thought losing that expense would save me some money. Unfortunately, it ended up costing me. Not only did I miss the face-to-face appointments and circuit training routines, but I also started losing the definition and my weight loss slowed down. And I realized I was not lifting weights, getting to the gym, or walking as often. Preserve muscle mass as I lose weight and age. Tone my body all over. Build arms like Angela Bassett's. Trish and I strength train two to three times a week, lifting weights for half an hour with no rests. No workout is the same, but I usually start with the arm bike and rowing to warm up and get my heart rate up into an aerobic zone. We then move into alternating upper-body and lower-body moves. 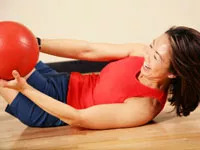 Not a second of our session goes by without some type of dumbbell, medicine ball, or resistance band in my hands, and my favorite moves are tossing a medicine ball against a wall (hello, arms! ), assisted chin-ups, and doing crunches on a yoga ball with weight. Weight training can help support weight loss in other ways too: Women who do resistance training three times a week preserve more of their lean body mass than women who do aerobics three times a week with no strength training, according to a study from the University of Alabama in Birmingham. The same study shows resistance training also keeps women's metabolisms up after losing weight. My number one goal—preserving muscle mass as I lose weight—will not only help me look great once I reach my weight loss goal, but it'll also help me stay strong as I get older and keep my metabolism up. In the years I've been working out at this gym, I've kept up with my body composition using the BodPod test (just $25 a pop at my gym). When I first started tracking my composition with the BodPod, I weighed 249 pounds; my lean body mass was 125 pounds. At last check, my lean body mass was 119 pounds. I've lost lean mass as I've lost weight, but I think I would have lost more had I not been lifting weights. Although strength training is helping my weight loss efforts, I don't have a specific number in mind. I set interim goals and I have an ultimate target range, but my real goal is about 25 percent body fat. This is why I keep tabs on my body composition. As my lean mass changes, I'll have to shift my final goal weight. Many physicians recommend sticking to a range on the Body Mass Index chart, and it's the current standard. But for years I've been more comfortable with setting my goals by body composition, because it allows me to better customize my goals based on my own body. I'm due for another BodPod test, but I've been putting it off a bit, hoping to build a little more muscle now that I'm working with Trish. I'm seeing the results of strength training and walking for an hour two to three times a week, but my goal is to bump the walking up to four to six mornings a week, for an hour each session. Do you strength train? I'd really like to hear what you're doing. There's still a stereotype that women remain intimidated by the thought of pumping iron, but I'd like to think that tide has turned. What are you doing, and do you have any strength-training goals?